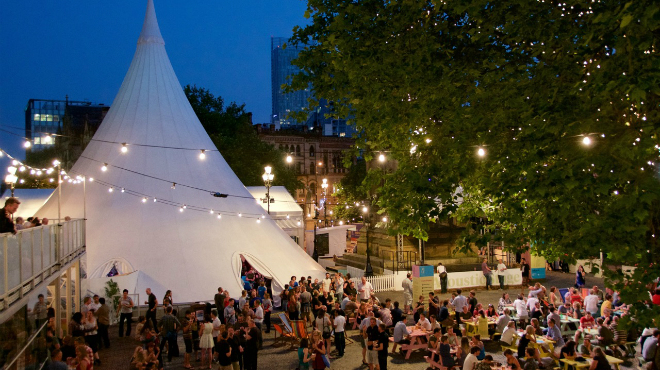 Dubbed by The New York Times as “One of the leading worldwide incubators for new, cutting-edge art”, Manchester International Festival is back and set to stimulate the minds of thousands of visitors from across the world in its 18-day dynamic programme of events. We sat down with the Managing Director of the festival, ex Time Out Marketing Director and self-proclaimed ‘organiser’, the inspirational Christine Cort. Within minutes it’s clear to see how passionate, articulate and likeable Christine is. From an early age Christine admits she had a “desire to move people around to see the best stuff” and tells us of the mini-bus trips she would organise from her hometown of Blackburn into Manchester to witness the very best in music and culture. Their mission was clear. The festival was to focus on “empowering artists to do those things that they’ve never had the opportunity to do, to help them get off the treadmill they’ve been on and really see their potential”. Christine’s marketing background shines through as she discusses her primary focus on the MIF brand, its core values and creative properties. Many of the early days, Christine says, were spent in a room with Peter Saville and Tony Wilson teasing out the ‘anything is possible’ manifesto of the festival. In the early days of her 5 years at Riverside Studios, Christine tells us of the time herself and her peers organised illegal late-night raves in order to fund the development of a new cinema. Just one example of her get-it-done attitude.